Five college-bound friends spend their last summer together as counselors in a girls’ camp, coping with homesick little girls. The friendship and adventures of Emma, Megan, Cassidy, Becca, and Jess unfold in alternating first-person chapters at Camp Lovejoy in New Hampshire. Absent boyfriends cause concern, of course, but camp activities and personalities are at the fore. New to the camp counselor business, the girls make some missteps at first, but, inspired by their hometown book club, they come up with a wonderful idea to distract their little charges from homesickness. They purchase enough copies for all their campers of Understood Betsy, a 1916 children’s book, about a girl sent to live on a farm and how she learns to enjoy its routines. Frederick keeps this series closer light, mixing protagonist-age–appropriate concerns such as college and boyfriends with pranks, songs, poems, food, and games—activities within the realm of the book’s audience. Mild excitement presents itself in the form of a threatening weather event. There are surprisingly few book discussions, but Frederick returns to Understood Betsy occasionally to make some points. 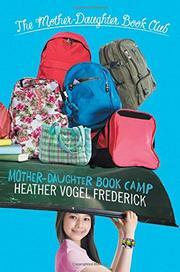 The protagonists are white save for Chinese Megan, but there is a decent degree of diversity among the campers.